Using Outline for Mac? Here comes the special-for-you post! New Outline – New Opportunities! We are pleased to announce the new release of Outline for Mac and iPad – version 3.6. We have been working hard to make it more productive and handy, so you are welcome to read about new impressive features! The biggest improvement in this update is support for iOS 9. With the latest iOS, Apple has added some new multitasking features – Split View and Slide Over. Split View shall be used for running two apps side-by-side. 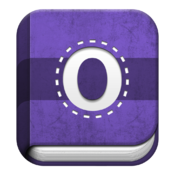 It enables you to launch Outline with another app and interact with both apps at the same time. You can seamlessly copy and paste text from Outline app to second app and vice versa while both are open on your iPad’s screen. Slide Over doesn’t allow to use two apps simultaneously, but you can quickly switch between them and go from task to task. For example, take notes and read e-mails, check meetings in calendar or reminders. 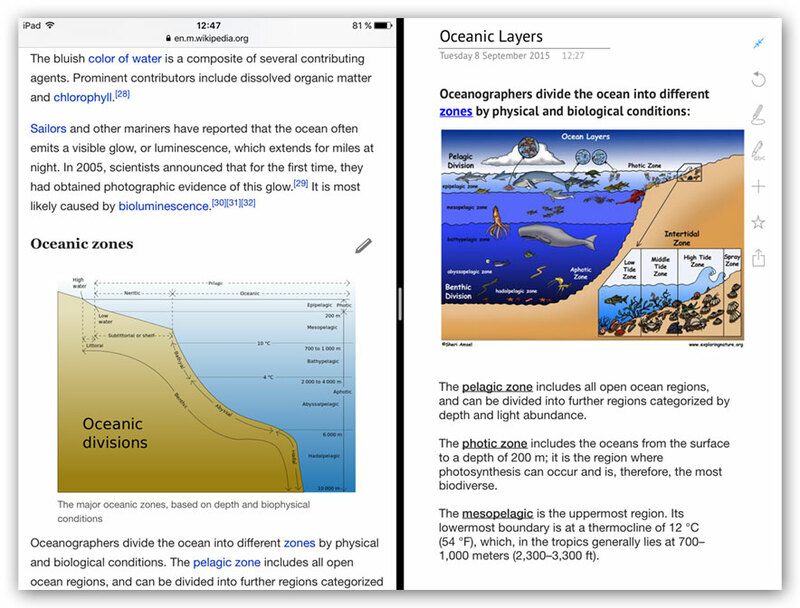 Both Split View and Slide Over are accessed by swiping left from the right side of the iPad. Please note that you will need an iPad Air, iPad Air 2, iPad Pro, iPad mini 2, iPad mini 3, or iPad mini 4 for Slide Over, and an iPad Air 2 or iPad Pro for Split View. Next we have the Spotlight Search! Just swipe down on any Home screen of your iPad and you will be able to look for almost any content from Outline. To be more precise, you can search for text on a page, section name, page name, name of an attachment, and even for text on a picture or printout. Tap on a query and you will be taken directly to the right place within Outline. With Spotlight feature, there is no need now to keep in mind where each specific note is placed. And finally, the latest version of Outline brings new keyboard and Multi-Touch gestures for it to simplify text editing and selection. Shortcut Bar on the keyboard includes all the editing tools which were placed on the top of the page before. To control cursor placement tap everywhere on a page, then place two fingers on the keyboard and move them, the cursor will follow your direction. If the cursor is placed within some word, tap with two fingers on it and iOS will select the word, after that extend your selection by swiping to the left or right. It’s always an extremely important thing to make sure you have backed up your data. iCloud Backup will be a good choice for this. You can set up the interval for automatic backups or do this manually. In any case, don’t forget to enable this option in Outline and device settings. We have added an ability to back up locally in Mac version as well. 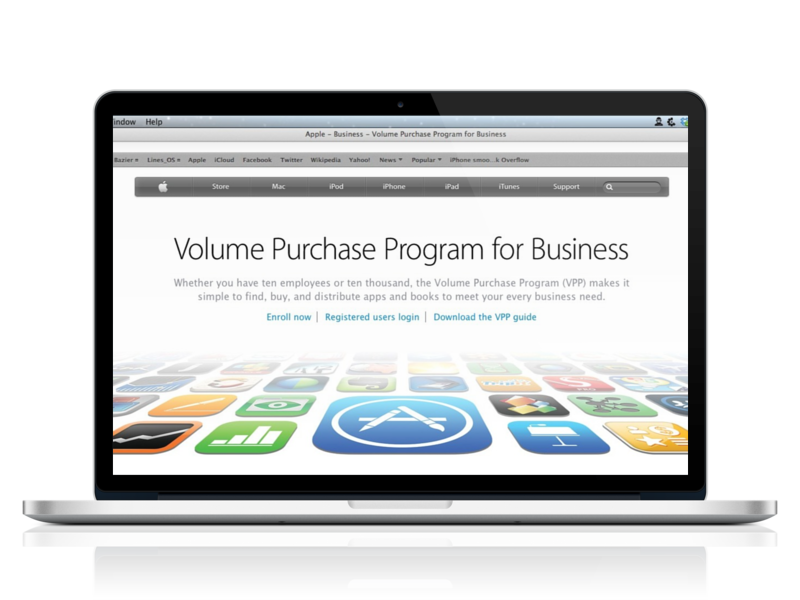 It is turned on automatically when you are logged out of your Apple ID account or don’t use iCloud at all. 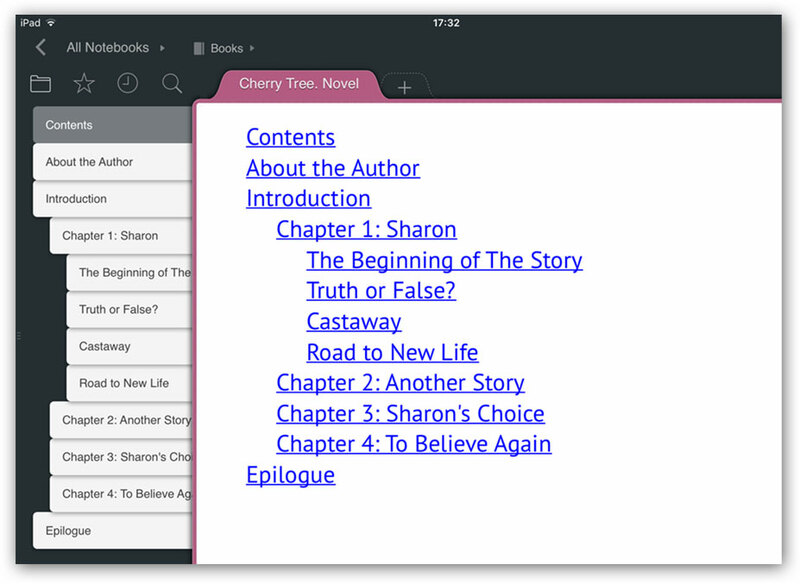 Outline now allows to insert Table of Contents, including a whole structure of your notebook: pages, sections, and groups of sections or just a current section with internal links between them. You can find this option by tapping the + button on the left of a page in iPad version and by clicking the same button, but on the top in Mac version. 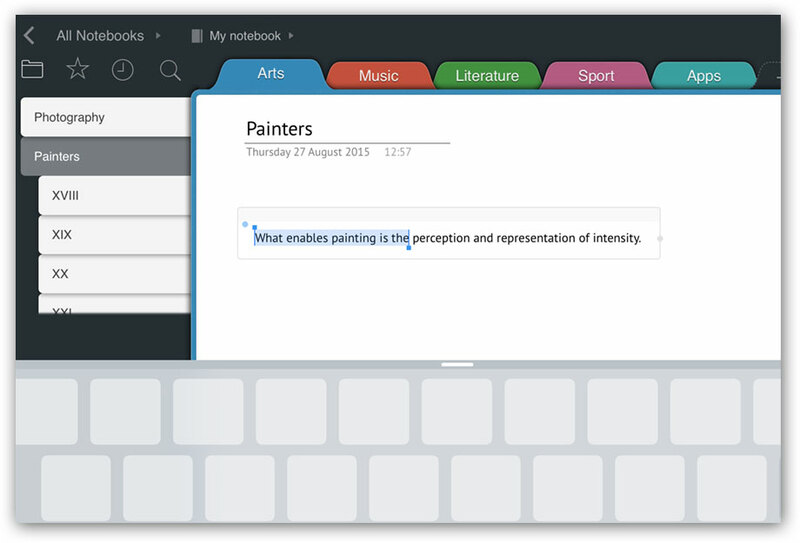 It is the easiest way to have a quick look at the structure of your notes and jump to the specific page you need. By the way, all the links are now clickable after exporting a page to the PDF format. You wanted it, we did it! A little, but a very useful new option appeared in the contextual menu. When you copy text from a web page, e-mail, or some other app you can paste it without source formatting. 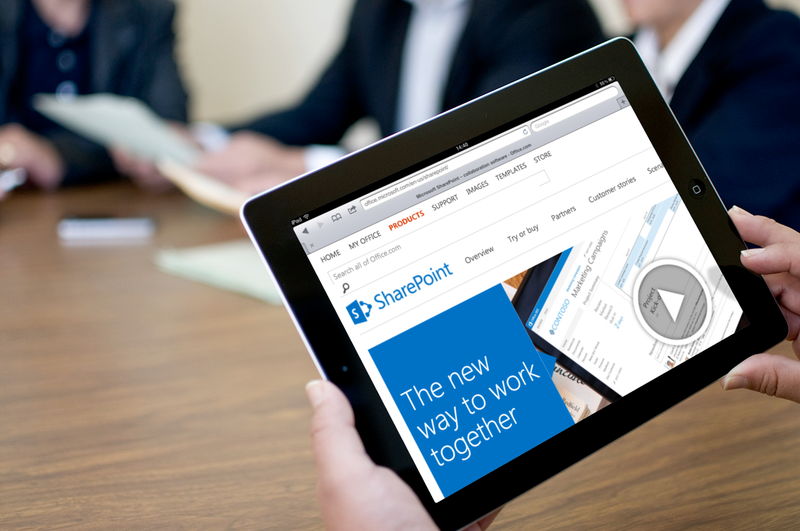 The feature removes font size, color, images and all the rest, converting any text into a text with default style. As usual, we paid attention to stability improvements and bug fixing. 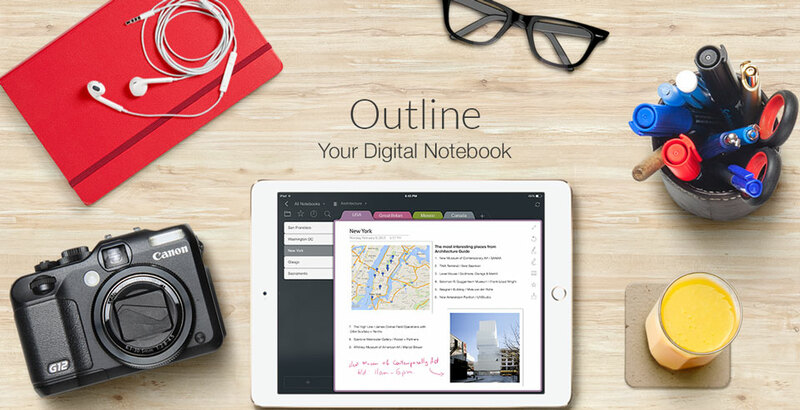 Outline team wishes you fun and productive note-taking! - Only one retweet for the entire contest! 15 winners will be selected randomly. We will send gift codes to their emails on Friday, February 13th. And don’t forget to provide your e-mail address via message. 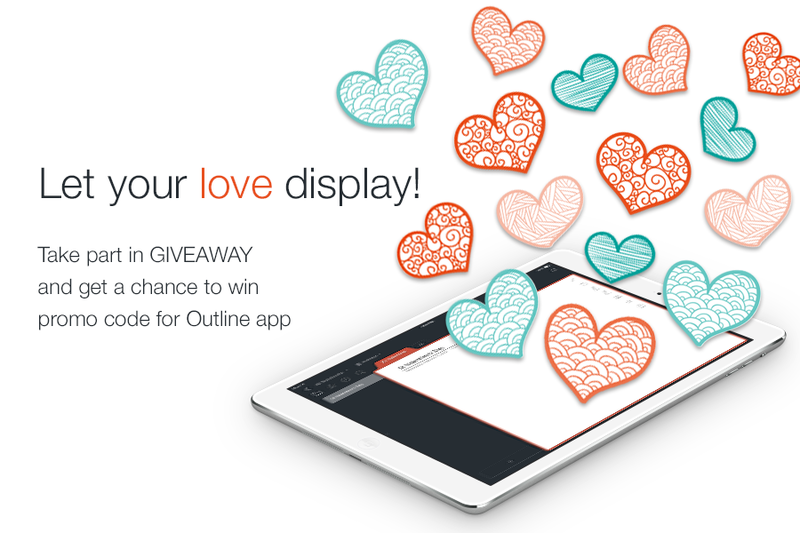 It’s your chance to gift Outline app to your beloved! So feel free to take part right now!